South Africans threaten to launch Xenophobic attacks on foreigners including Nigerians - SWANKYLOADED OFFICIAL BLOG. 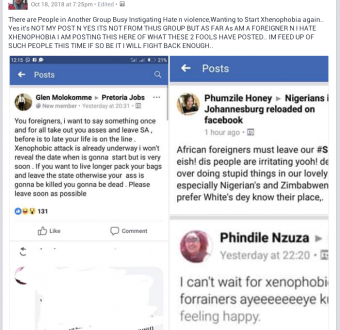 A lady has raised alarm over a plan by some south Africans to launch Xenophobic attacks on black foreigners particularly Nigerians. In the screenshots she posted, one of the South Africans claimed that the planned Xenophobic attacks are underway and if foreigners want to live longer they should pack their bags and leave. Another one gleefully said she can't wait for the attacks to start.